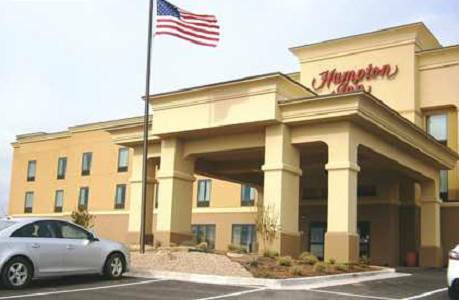 Come and make yourself at home in the comfort of Hampton Inn located in the heart of Oklahoma*s Oil and Gas Industries. 30 minutes from Will Rogers Airport and 10 minutes from Chickasha Municipal Airport. Situated between Oklahoma City and Lawton off of I-44. Chickasha is only 30 minutes away from Norman OK home of the Oklahoma Sooners. We are conveniently located within 30 minutes of 5 full service casinos. If you are in town for business you might like to know that we are just minutes from Nicola Banking Systems Hermetic Switch Canadian Valley Tech Center Gabriel Ride Control and Grady Memorial Hospital. The University of Science and Arts of Oklahoma is also nearby. Naturally we have free internet access throughout the hotel and a well-equipped business center. Chickasha offers many attractions throughout the year such as the Annual Pre-War Auto Swap meet held every March Rock Island Art Festival held every year in October. We are home to The Annual Festival of Lights held at the 43 acre Shannon Springs Park starting at Thanksgiving going through New Years Day. Which features over 3.5 million lights. Chickasha is also home to one of the last standing Drive-In Movie Theatres in Oklahoma. The Chief Drive Inn built in 1949 offers two movies for the price of one. We offer a range of amenities in each guest room for a relaxing night which includes Coffee Makers Comfy Beds Wired/Wireless High Speed Internet Service Handy Lap Desk Alarm Clock/Radio Flat Screen Television Iron and Ironing Board If you*re looking for hotels in Chickasha OK that serve a hot breakfast look no further. Each morning we serve a complimentary breakfast or if you*re in a hurry grab a nutritious Hampton On the Run Breakfast Bag to go available Monday to Friday. Plan your activities for the day in our 24 hour Business Center. All reservations must be cancelled at least 24 hours in advance host time unless deposit is required. If this reservation has been made electronically please cancel it electronically to avoid confusion and a no show bill. Policy is subject to change. Stop by and enjoy our great Mexican and American food in a fun family atmosphere. Ice cream treats and fast food. A-E Grill*s commitment to quality food and extraordinary service making A-E much more than your average bar - grill.